Directed by Rodrigo Cortés. Starring Ryan Reynolds, Stephen Tobolowsky, Samantha Mathis. Let me just start by saying that this film is brilliant!! I had heard about the concept (90 minutes with a man stuck in a box/coffin with a lighter and a cell phone) and I was already waiting for pretty claustrophobic experience. However, what I also found was an incredible roller-coaster of an action movie, wonderfully told, constructed, directed and perfectly balanced. And, more importantly, despite its premise, it was never boring, slow or repetitious (I don’t think there’s a single shot being repeated twice). In fact, they even managed to have a couple of really tense action scenes: yes action scenes within a box!!! The director has been very brave to even attempt something like this, but he’s also been able to play the game within the rules he had set up and never cheat: the camera never leaves the confinements of the coffin. This is a film that Hitchcock could have made, and he would have made him proud! You know you’re in for something quite interesting from the title sequence itself, which once again is reminiscent of those Saul Bass titles in a Hitchcock’s movies. They’re beautifully designed, perfectly paced and they’re accompanied by a sort of “Hermanesque”score that you would probably expect from an action movies, but not from a movie which you know it’s going to take place inside a coffin. And that pace, energy and inventiveness permeates the whole film from there onwards. The first few minutes are probably the toughest to watch (well, in fact there’s very little to watch since most of that time is spent on a black screen): it’s the moment when our character realizes he is “buried” alive. It’s a claustrophobic experience, beautifully orchestrated just with simple sound effects of his body moving around, thumping against the side of the coffin (the use of the 5.1 sound is impressive), breathing heavily and then finally screaming. It is excruciating! At one point I remember thinking to myself: “If it is all like this I don’t know if I’ll be able to take it…”. But somehow, once the film gets going and the mystery unravels, then you almost became used to the settings, just like the main characters gets used to it too. I don’t really want to give away too much, because part of the fun is discovering what’s going as the story unfolds. The script is beautifully constructed, giving the audience new and interesting clues every few minutes, thus making us always intrigued and, as I said before never bored. There’s a sequence involving a snake at some point, that might be a bit of a cheap trick but actually ends up being one of the most accomplished action-packed moment I’ve seen in any action film this season. To be able to pull something like that off, it is an achievement indeed!! And just when you think the film may run out steam, here comes a new idea and a new trick in the bag. I may even go as far as saying that despite the overall silliness of this movie, it is at the same time one of the most accomplished and inventive I’ve seen in a while. Technically it is pretty much faultless too: the camera swoops around the box showing you the action from any conceivable point of view and using pretty much any every trick in the book (zooms, tracks, extreme close-ups and so on). The sound design and sound mix on this film are both just as important and they are both top-notch, as they’re so carefully balanced to making you really feel you’re in there inside the box. I am looking forward to seeing what the BluRay will look and sound like (This will be coming out around Valentine’s Day, although I cannot think of a worse date movie…). I should also spend a couple of words praising Ryan Renolds, who literally carries the whole film on his shoulders as he’s on screen from every single second. The music, as I mentioned before for the title sequence, treats it all like a real action movie and to me that was probably slightly overdone. It works for most of the film, but I can’t help thinking it was a bit too bombastic in a few other places. But I am really picking needles here and I shouldn’t, because this is a little MASTERPIECE: it’s not just a tagline or a gimmicky one-trick-movie, but it’s a true lesson on creating and building tension in a movie. Rodrigo Cortes understand film-making, how to build tension and how to sustain it throughout. He’s been able to create an action film which is also, moving and funny in places. I can’t wait what he’s going to do next. 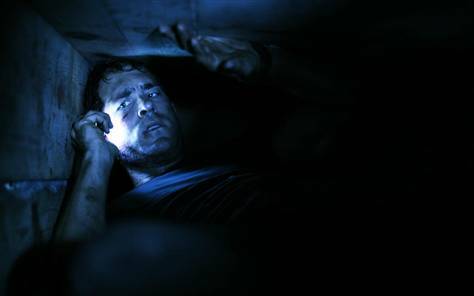 I can see that “Buried” might not be for everyone, and it’s definetely not for the faint-hearted or those people who suffers from claustrophobia, but if you like tension, thrillers, action romps or simply good film-making and pure cinema this is for you! I got on Netflix today. Looking forward to seeing it tomorrow. I just saw the movie this weekend. I was surprisingly impressed with it. The ending left me gasping for air. Reynolds was a great choice.